Cheng keeps her listeners at the edge of their seats from the first note until the last...a brilliant, sensitive, imaginative and most beguiling pianist. Cheng played the Prokofiev with great and startling power. The sledgehammer-like chords, the frenetic passage work, all were delivered with a kind of fierce energy. ...her control of the keyboard is complete, her technique easy and relaxed, with a wide range of touch, color and dynamics. ...negotiated the musical conversation with great subtlety and elegance. ...making the most of the comfortably shifting textures and tones, using her keyboard as an expansive elaborate palette...received the expected, but well-earned, standing ovation. The legendary Claude Frank described Amy Cheng as “a brilliant, sensitive, imaginative and most beguiling pianist.” At the age of 17, Amy Cheng won the New England Conservatory Concerto Competition and made her Boston debut performing Liszt’s 2nd Piano Concerto at Jordan Hall with Benjamin Zander conducting. Under the auspices of the Guild of Composers in New York City she gave her New York debut recital at Merkin Hall in 1998. In 1999 Cheng returned to her native Taiwan and won the Rising Young Artists Competition in Taipei. As a result, she was presented in a recital at Taiwan’s National Recital Hall and a national concert tour filled with encores and standing ovations. The following year she won the prestigious 2000 Heida Hermanns International Young Artists Piano Competition. Winner of still other competitions and awards, Amy Cheng was invited by the Formosa Chamber Music Society to perform a solo recital at the Weill Recital Hall at Carnegie Hall. Reviewing that concert, the New York Concert Review said, “her control of the keyboard is complete, technique easy and relaxed, with a wide range of touch, color and dynamics." As a founding member of the former Goffriller Trio, she performed in the Third Jerusalem International Chamber Music Encounters directed by Isaac Stern. She has performed with the Van Dingstee String Quartet from the Netherlands and toured with the American Chamber Players. Festivals and venues at which Cheng has performed include the La Jolla SummerFest, Gilmore International Keyboard Festival, Isabella Stewart Gardner Museum, Tsai Performance Center, and the Lausanne Academy of Music in Switzerland. In addition to her own schedule of performances, Cheng is the pianist for Duo Clarion, formed in 1999 at Yale University with clarinetist Chad Burrow. Duo Clarion maintains an active series of performances throughout the United States, Europe and the Far East. Their work has been recorded and released by Albany Records and by Wei Studios. Duo Clarion has garnered rave reviews and standing ovations from performances in Boston, San Francisco, Vancouver, Taipei, and throughout their most recent tour of Denmark. They have thrilled audiences in performances presented by the Amadeus Piano Festival, Norfolk Chamber Music Festival (CT), Music in the Pines Concerts at Stephen F. Austin State University (Texas), Stonington Opera House Summer Series (ME), Civic Music Association of Oklahoma City, Oklahoma City Chamber Music Series, OK MOZART International Festival, and the Chopin Society of Mid-America. They also have been featured in concert performances at national and international conferences including the Society of Composers (2004), the 32nd Annual Clarinet Symposium at the University of Oklahoma, and the International Clarinet Association’s 2007 Conference in Vancouver. Duo Clarion enjoys collaborations with other professional ensembles such as the Providence String Quartet, Van Dingstee Quartet from the Netherlands, and they are delighted to be doing a residency with Community Music Works in Providence, Rhode Island this season. Together, Amy Chen and Chad Burrow serve as co-Artistic Directors for the Brightmusic Chamber ensemble and its series of six programs in Oklahoma City. Cheng was the featured soloists with the 'Musica Viva' Moscow Chamber Orchestra under the direction of conductor Alexander Rudin, and in performances of Mozart’s Piano Concerto No. 22 with the Taichung Philharmonic, Rachmaninoff’s 2nd Piano Concerto with the Orchestra of the Pines in Texas, and Liszt’s 2nd Piano Concerto with the Oklahoma Youth Symphony. Her performance of Gershwin’s Rhapsody in Blue with the Oklahoma Community Orchestra was such a resounding success that she was re-engaged to perform Chopin’s Piano Concerto No. 2 during the 2007-08 season. 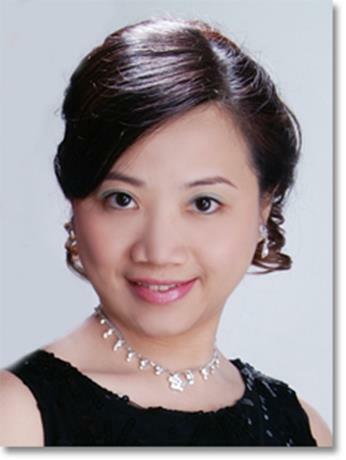 Cheng enjoys presenting master classes and serving as a judge for competitions in Taichung, Texas, Tennessee and Oklahoma. Her students are recipients of numerous local, regional, and international prizes and awards. A graduate of The Curtis Institute of Music (BM) and the Yale University School of Music (MM and Artist Diploma), Cheng Studied with Claude Frank. She is currently a Doctor of Musical Arts candidate at the New England Conservatory in Boston, where she studied with Ms. Wha-Kyung Byun. She has performed in master classes for Emmanuel Ax, Boris Berman, Leon Fleisher, Murray Perahia, Gary Graffman and Mischa Dichter. She has studied chamber music with Robert McDonald, Michael Friedmann, John O'Conor, Peter Frankl, Isaac Stern, and the Emerson String Quartet, American String Quartet and Orion String Quartet. She was Assistant Professor of Piano at Oklahoma State University in Stillwater, Oklahoma from 2002 to 2006, at which time she was appointed head of the Piano Area and Assistant Professor of Piano at Oklahoma City University.